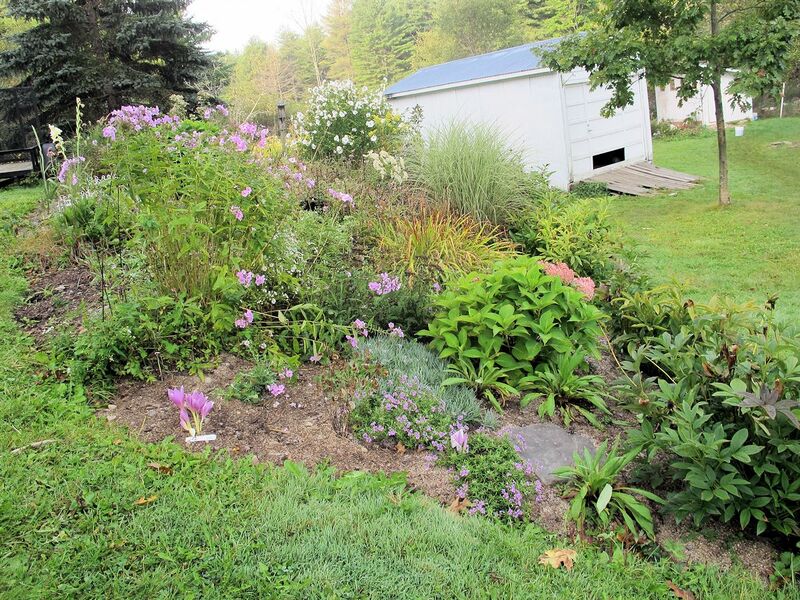 Many gardeners complain of a surfeit of yellow and gold in the fall garden, but mine is a preponderance of lilac-pink. The dry spell we had this summer caused many spring bloomers, including the Phlox subulata ‘Purple Beauty,’ to rebloom this fall. When I planted the phlox on either side of the Colchicum agrippinum, I thought its low-growing foliage would make a pleasing backdrop to the leafless colchicum flowers, and gave no thought to the phlox’s blooms, which match those of the colchicums pretty closely. The tall border phlox (Phlox paniculata) to the left has a similar hue, and the hydrangea on the right, while not an exact color match, plays along nicely. Since I inherited the tall phlox and the hydrangea in those precise locations, I can’t take too much credit for this tableau, but I am well pleased nonetheless. 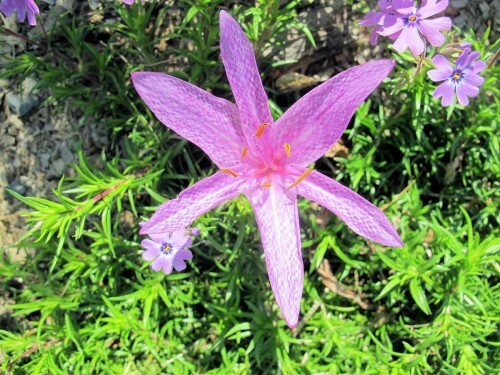 Colchicum agrippinum is not a vigorous grower for me, but I love those checkerboard petals, so I baby it along. Mostly it needs better drainage than I usually have on hand. Above is a closer view of C. agrippinum with a few blossoms of the creeping phlox. Most colchicums don’t have such distinct tessellation, though ‘Disraeli,’ which I just planted this year, does. I have gobs of colchicums blooming everywhere. I planted these colchicums last September, before I even moved in. I seem to have a lot more than I did at the old house, even after sharing my surplus with others. These pictured by the stone wall are the misidentified ones I think of as impostors. They are very big and very vigorous, forming numerous new corms each year, but I don’t know their true identity, as they were sold to me as three different plants. 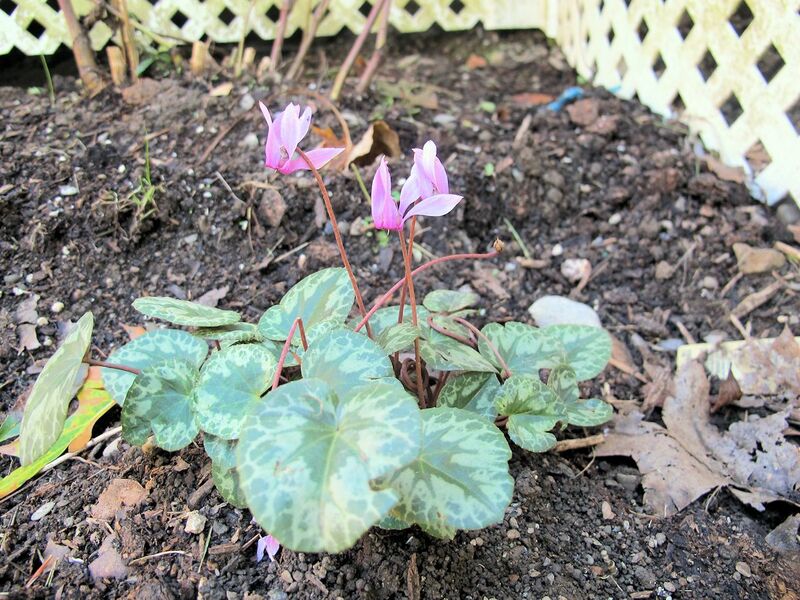 I moved this petite cyclamen over from the old garden fairly recently. I had planted it in front of a flowering almond there, but as the shrub grew, the cyclamen wound up under it rather than in front of it. I hope it will become more floriferous now that it’s no longer buried in foliage. This cyclamen is supposed to be the hardiest species. It has slowly but steadily grown over several years, so it’s hardy enough for me. I’m in zone 5b, southern Ontario. We probably had a similar July. Very dry for us. Oddly, I have some rogue morning glory poking up along the edge of a path. My phlox is almost finished, but it had a second flush earlier this month. I’m not getting a second flush on my creeping phlox. I wanted those pinks and pastels in my fall garden. It’s like a spring garden. The Colchicum is lovely. I must look for that. I’m getting a lot of primulas reblooming this fall, which really surprised me. I hope it doesn’t affect their blooming next spring. Some of the clematis are reblooming also, but not so much. I was always partial to the golds and russets but looking at your pictures makes me want to save a little space for the lilacs as well. I like all your fall pinks! I was just looking through a bulb catalog and debating about ordering some cyclamen for next year–I think you’ve convinced me! Beautiful fall color, even if not typically associated with fall! 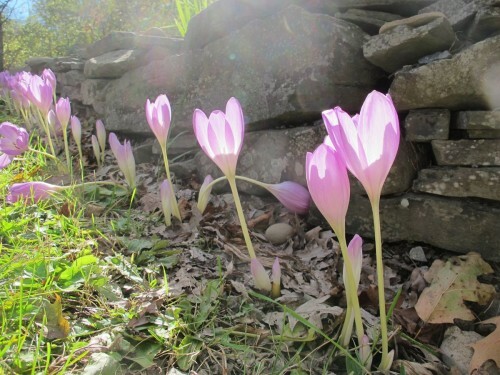 Your Colchicums are so pretty! We have some pinks here, but much more yellow and dark purple. When the pink muhly grass blooms, soon, however, we will be in the pink! Great insight! When I look at my garden, I also see more purple-pink-rose colors than I do gold and bronzey-red. I’m not complaining either. Happy GBBD! Our GBBD colors seem to match. I, too, have many blooms in pink/lilac studded by a few blues and a yellow or two. My phlox have had a wonderful season with many blooming since June. Put me in the yellow and gold column for September blooms, but I’m not complaining. Happy GBBD to you. It doesn’t look like fall there. I like the purple.